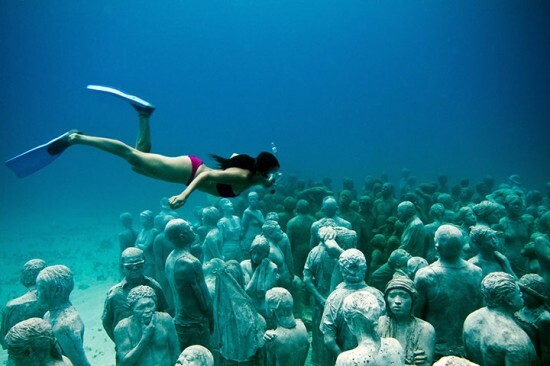 La dernière installation de Jason de Caires Taylor, sculpteur anglais qui crée d’inattendus univers sous-marins. Le résultat est tout à la fois beau, étrange et fascinant. Thankyou for sharing ElAyam.1 » Sculptures sous-marines with us keep update bro love your article about ElAyam.1 » Sculptures sous-marines . I agree with your ElAyam.1 » Sculptures sous-marines, wonderful post. Article vraiment bien rédigé et tellement bien compréhensible. Ça doit être très impressionnant de plonger et tomber nez-à-nez avec cette armée de statues ! Hi! This post couldn’t be written any better! Reading this post reminds me of my good old room mate! He always kept talking about this. I will forward this write-up to him. Pretty sure he will have a good read. Thanks for sharing! I have been surfing online more than three hours these days, yet I by no means found any fascinating article like yours. It’s pretty worth sufficient for me. In my view, if all website owners and bloggers made good content material as you did, the net can be a lot more helpful than ever before. Do you mind if I quote a few of your articles as long as I provide credit and sources back to your site? My blog is in the exact same niche as yours and my visitors would really benefit from a lot of the information you provide here. Please let me know if this ok with you. Thanks!